Lewis Rice member Marian V. "Bo" Mehan and Lewis Rice alumni Henry F. Luepke were inducted into the SLU LAW Order of the Fleur de Lis Hall of Fame on Friday, September 16. The Order of the Fleur de Lis is Saint Louis University School of Law's highest honor. It is given to alumni who proudly work to uphold the university's mission to seek excellence in the fulfillment of teaching, research, health care, and service to the community. Bo Mehan is Co-Chair of the Firm's Estate Planning Department and a longtime member of the Firm's Management Committee. With more than 20 years' experience, she advises clients on their estate planning, wealth transfer planning, estate and trust administration, and post-mortem planning. Bo's reputation as a leader in her field is reinforced by her commitment to continuing education. She is a frequent panelist and speaker on the topic of sophisticated estate planning. 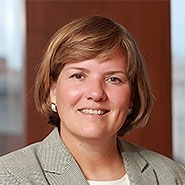 Moreover, Bo is committed to serving her community, and she plays many civic and charitable roles, holding various leadership positions with several St. Louis nonprofit organizations over the years, including Cardinal Glennon Children's Hospital Foundation, Chaminade College Preparatory, and Access Academy. Henry Luepke joined Lewis Rice in 1960 and retired in 2001. While at the Firm, Henry served on the boards of several local organizations, including University City Civil Service Board, Peter & Paul Community Services, Inc., and Center For Social Justice St. Louis University. Furthermore, he is the past president of Missouri Athletic Club, and he served on the Saint Louis University High Alumni board, among others.